The Woolshed Backpackers is a comfortable, clean and affordable way to explore Hervey Beach and beyond! Located in the heart of Hervey Bay and offers an affordable place to stay that is also clean, quiet and friendly! Full of character and offering an amazing atmosphere, the Woolshed is a home away from home where you can relax and refuel during your travels. Close to everything you could want including the beach, supermarket and shops! The Woolshed Backpackers is the ideal accommodation for budget minded travellers visiting Hervey Bay. Offering quiet and clean rooms as well as friendly service, the Woolshed is the perfect place to unwind and relax! Located on 1 acre of land, the four buildings are surrounded by lush tropical gardens, a fish pond, as well as beautiful trees that attract a variety of wildlife. 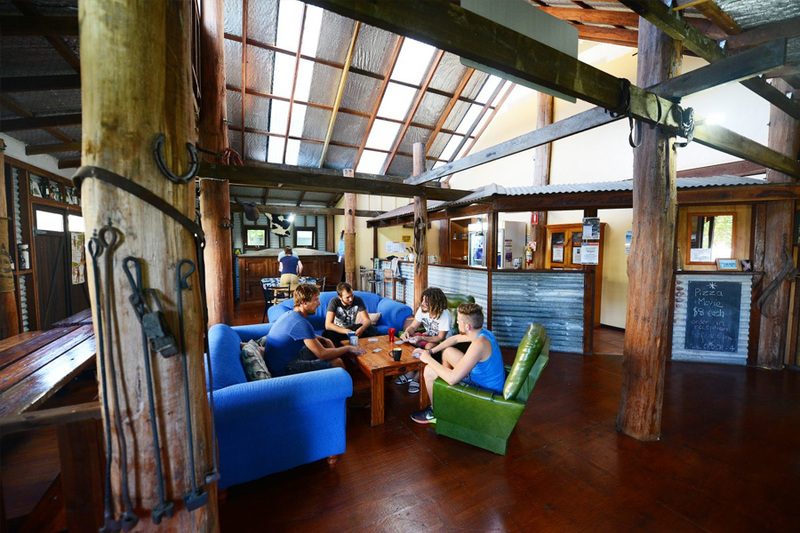 The Woolshed is known for its unique common room, which was constructed based on a traditional Aussie Woolshed, where you can sit back and relax and make new friends. Made completely of wood, the common area is also home to our shared kitchen, where you can cook your own meals and keep your budget in mind. Bursting with character and filled with a friendly vibe, this is the ultimate home away from home on a budget. Enjoy clean, friendly, country style accommodation nestled within a beautiful, tranquil environment at the heart of Hervey Bay for a home away from home during your travels to the Fraser Coast. Air conditioning is an extra $5 per night. It should be noted that travel involves risk. Whilst we make every effort to safeguard clients, we cannot be responsible for personal injury or loss due to actions of our clients which are beyond our control. We recommend that all clients have travel insurance covering illness, injury, loss or damage to personal belongings or not being able to travel on the confirmed date of departure. Please be aware operators pass on credit card merchant fees so there is a non refundable 2.5% surcharge for VISA and MASTERCARD card purchases. All cancellations made result in 25% cancellation fee of the recommended retail price (RRP), not discounted or sale prices. Any cancellations made 60-30 days prior to travel will result in a 50% cancellation fee and any cancellations made inside of 30 days to departure will result in forfeit of full trip fees. "I travelled the east coast recently and have to say that this backpackers was an absolute stand out! From the moment I arrived everything was perfect! The service is well above board which sets the vibe of the property. Nothing was a problem, and the private room was so cute- it was tastefully decorated, came with a tv, optional A/C and private ensuite. I was only there for a night but would happily return and love to spend more time exploring the beautiful Hervey Bay! Thanks, Megan and Brent - you were both amazing hosts with great staff and definitely a highlight of my trip!"